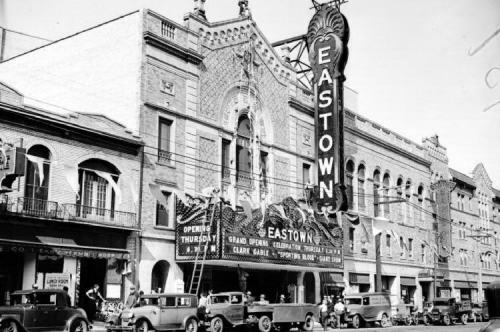 Sitting on a lot near the corner of Van Dyke Street and Harper Avenue is the once magnificent Eastown Theater. 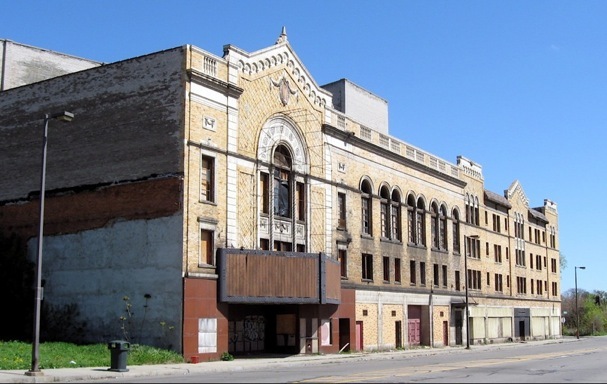 This graceful neighborhood theater, built-in the Renaissance Revival style, opened in 1930 as a movie house attracting patrons from the surrounding walk able neighborhoods. 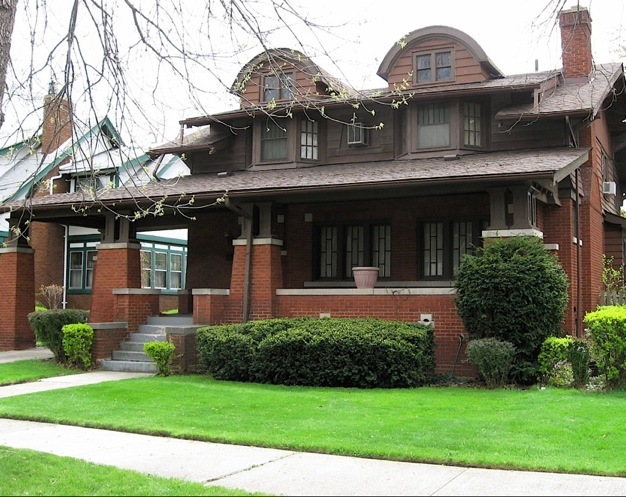 But like many grand, architecturally rich, structures I’ve spotted while bicycling throughout Detroit’s neighborhoods, time has taken its toll. Gone is the grand marquee and sign. Gone are many of the external ornamental sculptures. Many of the doors and windows are gone and so are the people who once supported the movies, plays and countless concerts this impressive place offered. 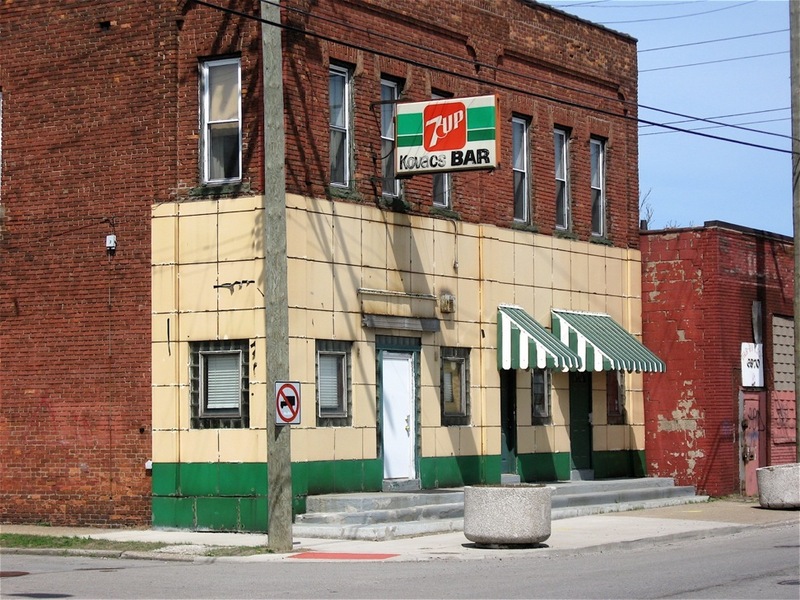 In many ways, it is indicative of the once vibrant neighborhood it served. After circling the Eastown, I headed up Van Dyke to see how this neighborhood has changed over the years. Most of the viable businesses that once lined the street are now closed and many of the buildings that housed them have been knocked down. But there are a few survivors, such as tire repair facilities, a couple of churches, a party store or two and some used furniture stores. 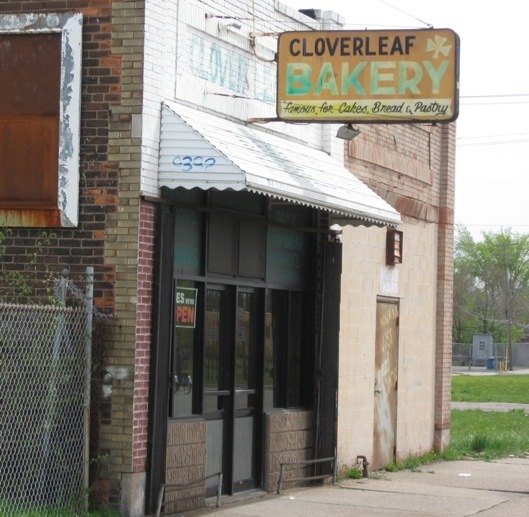 But there’s one particular business that caught my attention, the Cloverleaf Bakery. The Cloverleaf looked as if it’s been there forever and I was curious about its history. I stopped in front of the place, jumped off my bike, wandered in and checked out the selection of fresh-baked cakes, cookies and bread. While looking around, I noticed the original tin pressed ceiling and I asked the man behind the counter how long the bakery has been there. “Three months” he said. “How about 50 years and I’m 75” he said. No response. It was like a ‘guess my history game’, and it was obvious he wasn’t about to give the right answer or any answer for that matter. I took off and rode further north on Van Dyke. 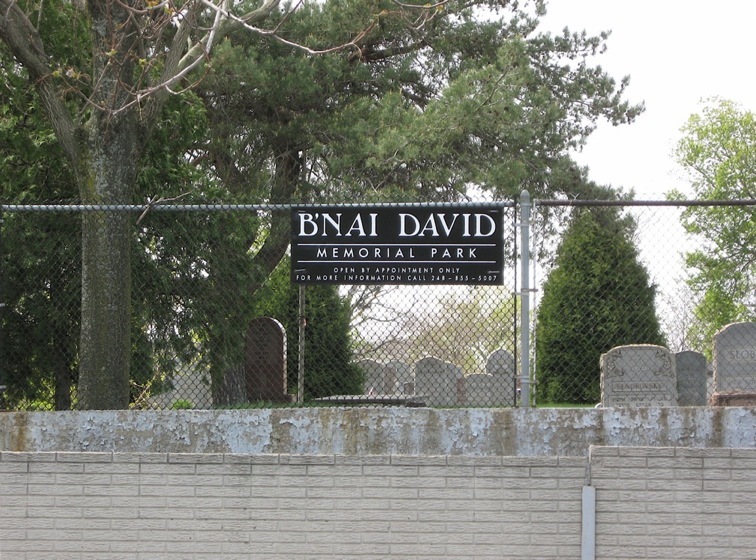 At the corner of Traverse Street I came upon the B’nai David Memorial Park, an old Jewish cemetery. It sits on a mound about six-feet above the road surrounded by a cement wall. Between the cement wall and the sidewalk, another brick retaining wall, reinforced by steel was built. I assume this was a protective measure to keep cars and trucks from smashing into the main wall, toppling it and the headstones that are placed quite close to the sidewalk and road. It would have been interesting to wander through this cemetery and read some of the inscriptions found on the grave markers, but, unfortunately, the gate was closed and chained. Heading south from there on Saint Cyril Street, I cut through a few side streets leading to the back of Chrysler’s former Lynch Road assembly plant, a massive place. Few people live on those streets and a couple of them had been closed off and barricaded, and now weeds are growing through the asphalt. It was interesting to see how those particular streets have morphed into the surrounding grassland environment. 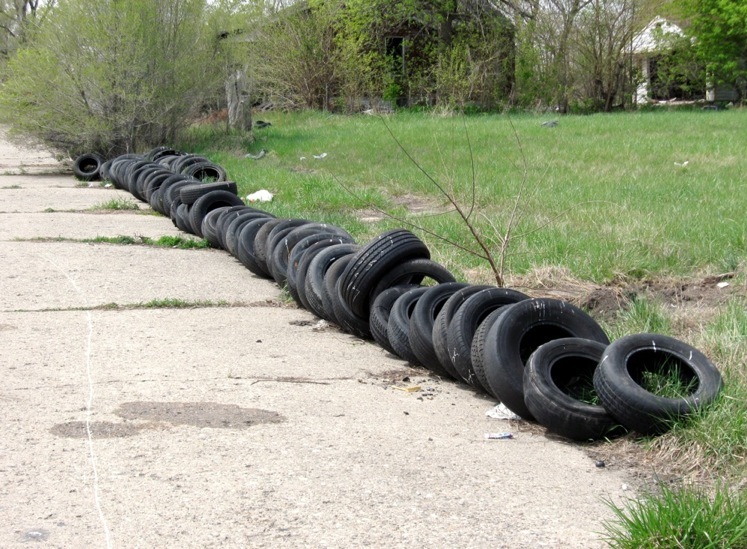 Sadly, the closed streets and the empty land around them is an open invitation to dumping, especially tires. Riding through there, I came across a trash pile that sparked my curiosity. So I stopped and rummaged through the mess and was surprised to find mail, medical records and magazines with complete names and addresses. Why was this stuff here? Who dumped it? Unbelievable! I rode away shaking my head, wondering how all that personal information ended up in this weed-choked field. *Photo from the Water Winter Wonderland collection. In 2005, a group of young musicians from Britain, Canada, U.S. and Australia came together at Sydney’s Opera House and Brighton Dome to record a live Leonard Cohen tribute album. The event quickly expanded into a documentary film featuring moving performances by the likes of Beth Orton who sang “Sisters of Mercy”, which gave me goose bumps. One of my favorites, Teddy Thompson, sings and plays guitar on “Tonight Will Be Fine” and Rufus Wainwright, with his extraordinary vocal range, sings his heart out on “Hallelujah”. Some would argue that his version is the best recording ever of that song. The film also includes performances by Jason Wade, Martha Wainwright, Antony and others backed by a tight band that included horns, strings and a great rhythm section. It also includes interviews with Cohen in which he offers insight into his extraordinary career and the songs he’s written. The movie closes with him singing “Tower of Song” with U2. If you’re a fan of or you aren’t familiar with Leonard Cohen, Canada’s legendary poet/writer/musician go out and rent this DVD, or watch it here. You won’t be disappointed. Highland Park is well-known for the Ford Motor Company’s manufacturing plant, the first of its kind in the world built to incorporate the moving assembly line. This opened the door to mass production of the automobile. It’s also the home of the infamous $5.00 a day wage structure Henry Ford implemented in the early 20th Century. 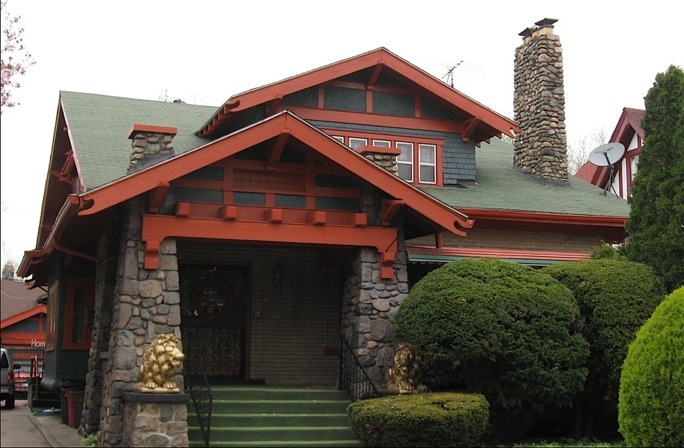 But what many people don’t realize is that Highland Park has one of the highest concentrations of Craftsman Bungalows outside the state of California. Since I haven’t been there in a while, I decided to check them out. 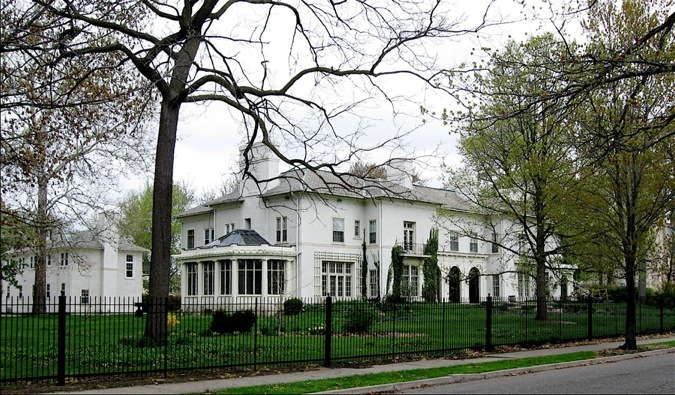 The Kresge Mansion is one of Detroit's largest homes. I began my two-wheeled journey to Highland Park on 2nd Avenue just north of Wayne State University. The avenue took me through the New Center area past the Fisher Building, an Art Deco gem, to the Boston-Edison Neighborhood, which is listed on the National Register of Historic Places and once home to Henry Ford. I took a little detour through those streets to check out the large cluster of mansions. 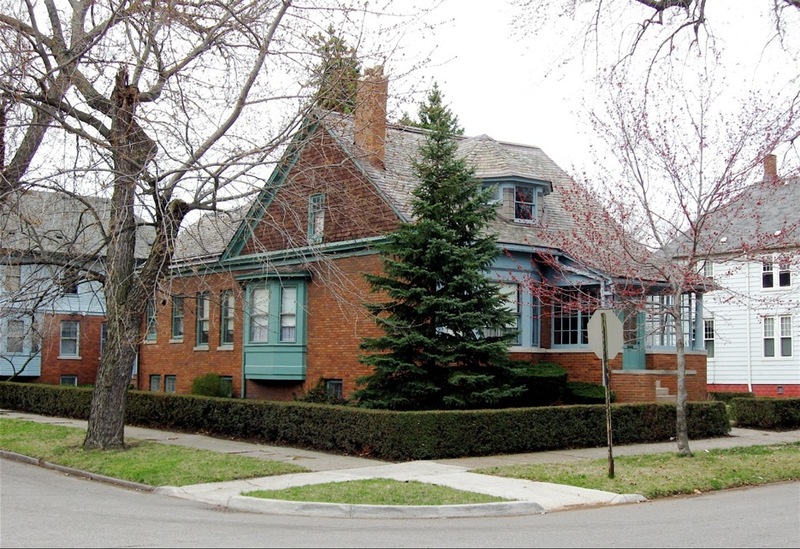 There are two on Boston Boulevard – the S.S. Kresge and the B. Siegel mansions – just west of Woodward that always wow me; they are so huge that they are the only two on that block. After pedaling through those streets, I continued up 2nd Avenue. 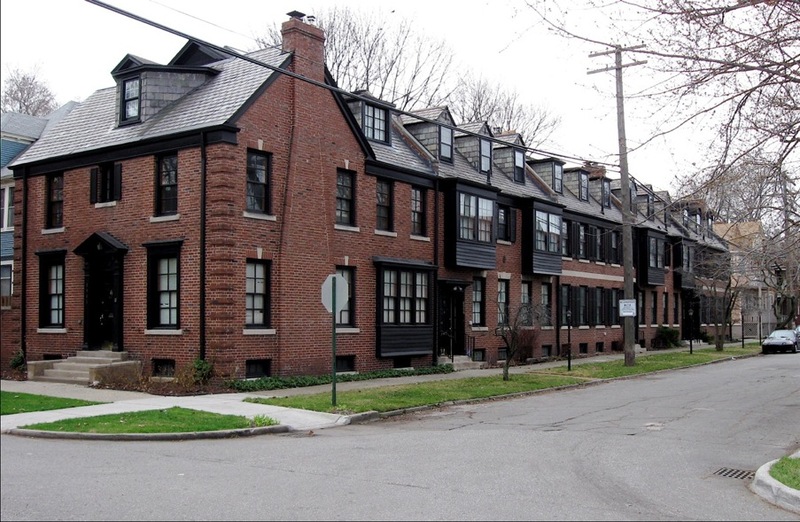 The homes in the neighborhoods along 2nd became much more concentrated with numerous apartment buildings sprinkled in. Some were in need of major repairs; others were in pretty good shape, and like many parts of Detroit, abandoned and stripped buildings were evident. I crossed into Highland Park and was pleasantly surprised at the strides the city has made in getting rid of blighted structures and replacing them with new brick townhouses and other dwellings. This is a good sign in a community, much like Detroit, that has been devastated by high unemployment, crime and tough economic conditions. Note the stonework on this inviting home. A couple of streets later I took a right, crossed Woodward Avenue, and headed east on Mclean Street. The blocks on this street are full of Craftsman style homes. Each is unique, but all possess the traditional Arts & Crafts characteristics; low sloping roof lines with rafters exposed, wide welcoming porches with distinct square pillars, tall inviting windows and some even have stones incorporated into the structure. These are amazing homes built during a time when Highland Park was one of the richest cities in the country. Beautiful craftsmanship and lines, one of my favorites in Highland Park. From Mclean Street I headed a little further north on Woodward to Moss Street where I proceeded west toward Hamilton Avenue. 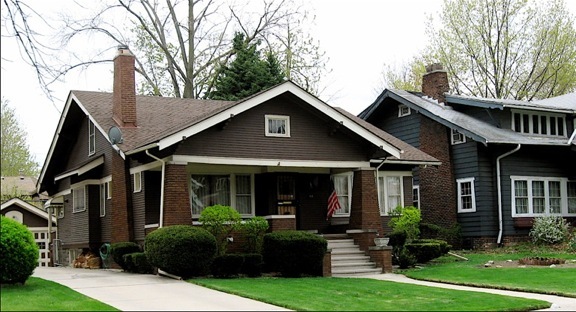 Like Mclean Street, the few short blocks I rode on Moss Street had a high concentration of early 1900’s Craftsman style homes. Impressive in their simplicity and clean lines, these homes are jewels that hark back to a simpler time. 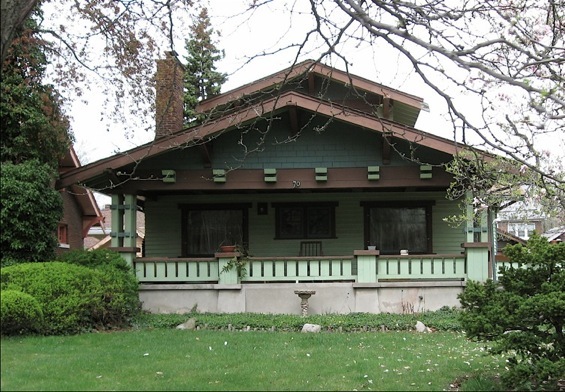 I was encouraged to see that many of these classic Craftsman Bungalows and Cottages were well-maintained and cared for. Take a look sometime. I think you will agree with her. Check out the interesting roof line and upper windows on this two-story home. 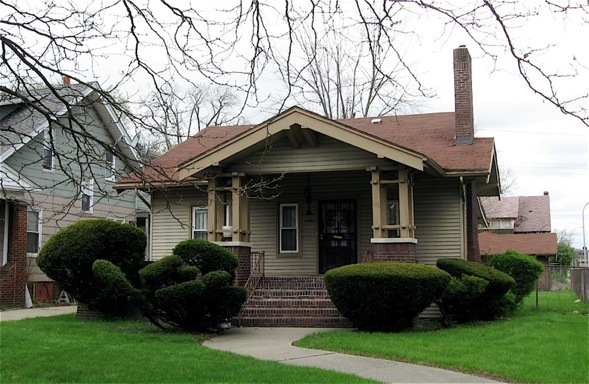 This Classic Arts & Crafts Bungalow style home can be found across the country. West Jefferson Avenue from Joe Louis Arena to the River Rouge city limits is a history lesson on Detroit’s heavy manufacturing legacy. Between the smokes stacks to the west and the Detroit skyline to the east, Jefferson is crammed with small, thriving manufacturing and service facilities that adjoin abandoned, structurally unsound, decayed buildings. 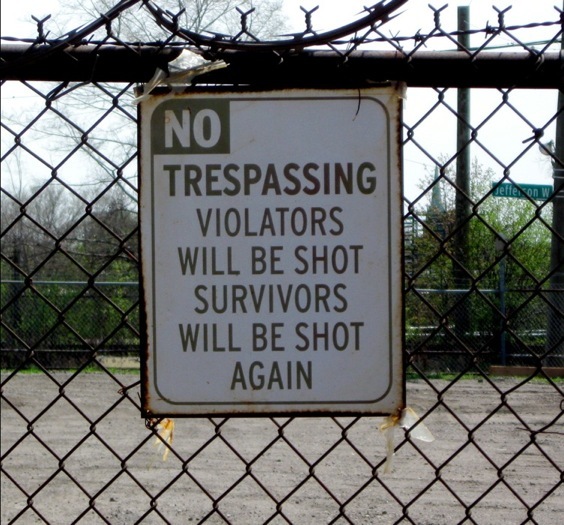 There are many warning signs found throughout the area. Many are surrounded by barbed wire with various security warning signs telling me to keep out and that I’m being watched. 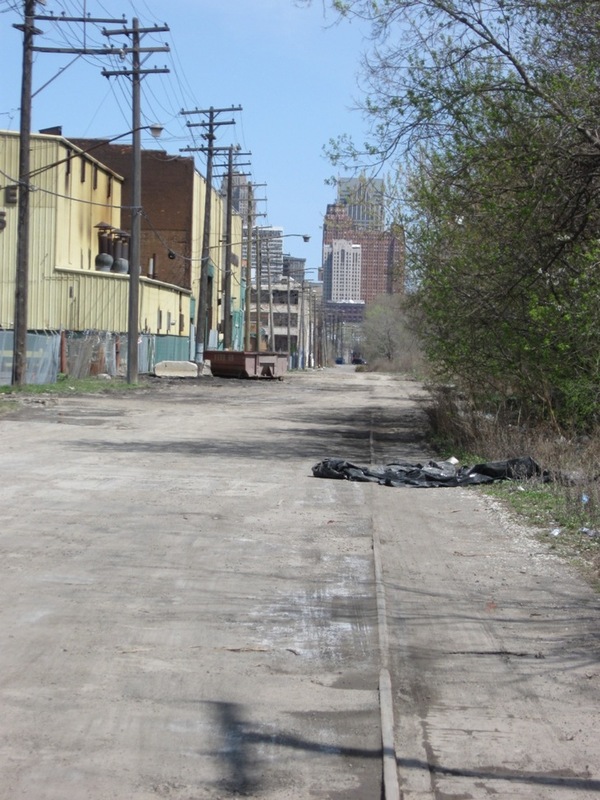 Riding westbound down the center of this potholed, rough stretch of Jefferson with functioning railroad tracks hugging the banks of the Detroit River on my left and aged industrial buildings on my right, it struck me how prosperous this part of Detroit once was. The vintage 1920’s brick buildings I saw were packed close to each other and most were a few stories tall. I’m sure in Detroit’s manufacturing heyday these small-to-medium sized shops fed off each other to supply the thriving auto industry and other industries related to it. Today, many of these buildings still appear to be used for manufacturing, others for warehousing of materials from the marine terminals, and some look as if they’re lived in. Jefferson Ave west of downtown Detroit. Looking at the roadbed while dodging potholes, I could see long-abandoned train rails peaking through the asphalt, their spurs leading directly to deserted, graffiti covered manufacturing facilities. In other sections, the original cobblestones and pavers have popped through, and they looked to be in remarkably good shape. Although it’s a little rough going on a bike for the first mile or so, West Jefferson does smooth out approaching the Ambassador Bridge. However, my journey came to a sudden detour at the bridge. As I soon discovered, West Jefferson no longer passes under the bridge. According to a sign posted nearby, Homeland Security closed the road under it as a security precaution. Marked detours routed me up 21st Street to Fort Street where I was able to continue west and finally pass under the bridge. Once past it, I was then able to take 24th Street back down to Jefferson where I continued my journey. At the corner of 24th and Jefferson is the Detroit Animal Control office. It also functions as an animal shelter where strays are taken and held for adoption. As I circled the facility I could hear dogs crying and barking inside. They seemed to be calling out for someone to adopt them. Not a place for dog lovers on a bike ride. Looking west at Detroit's heavy industrial area. Further down 24th Street is Riverside Park and it offers a beautiful view of the Ambassador Bridge with downtown Detroit to the left and the heavy industrial area on and near Zug Island on the right, both abutting the beautiful, clear blue water of the Detroit River. Quite a contrast. Fishermen were out in numbers and just as I rolled up to the river’s edge, one of them landed a nice size bass (or something similar) to the cheers of others. On my way out of the park, I noticed the J.W. Westcott tied-up and bobbing to the river’s constant movement. The Westcott is the Great Lake’s only floating post office and it continues to deliver U.S Mail to the passing ships as it has for over a hundred years. A little further down West Jefferson I came to Historic Fort Wayne, a mid-nineteenth century walled fort, covering over 90 acres of river front land. When the original fort was constructed about 300 years ago, it was strategically located here because it’s one of the narrowest sections of the Detroit River. The gate attendant told me the fort is open on weekends for tours and special events are also held during the weekend hours. When I was there, a flea market was underway. Note the decorative porcelain panels found on the exterior of Kovacs in Delray. Fort Wayne sits on the fringe of Delray, a once prosperous village where Hungarians, Poles and other eastern European immigrants settled. There isn’t much left of this once viable neighborhood that was incorporated by Detroit in the 1900’s. Kovacs Bar and a hardware/boat retailer looked to be the only surviving businesses along that section of Jefferson. Most of the other remaining retail buildings are crumbling, burnt, or covered in graffiti. 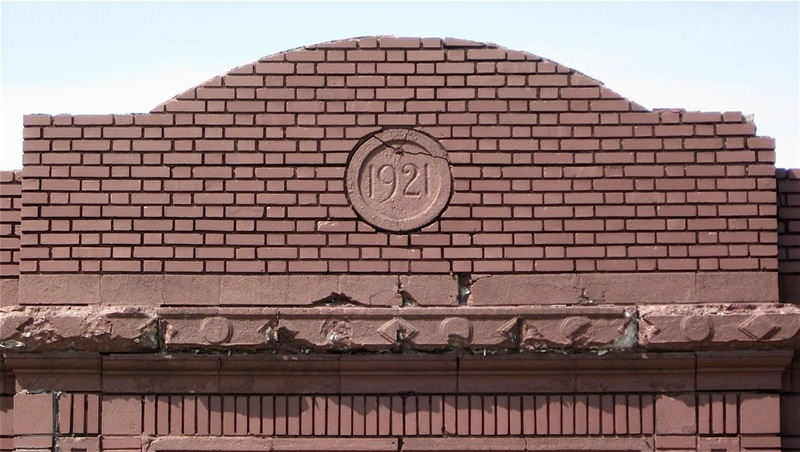 However, some of the 1920’s architectural details are still evident. Many of Delray's commercial buildings were built in the early 20th Century. Delray is isolated and surrounded by heavy industry. Immediately across Jefferson is Zug Island, home to a thriving steel mill where freighters pull in to unload raw materials used to produce the steel. Chemical plants are nearby and the Detroit Water and Sewage treatment plant is also located close by. Although there was an industrial/sewage stench in the air, I didn’t find it as bad as it once was. The Rouge River and various inlet channels looked clean as well. I even saw ducks paddling in the channels. 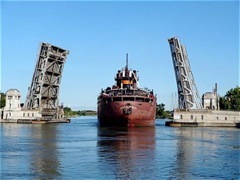 The Rouge River Bridge opens to allow passage of freighters. Photo by Nathan Nietering. The Detroit city limits ends once West Jefferson Avenue crosses the Rouge River Bridge leading into the city of River Rouge. The bridge, built in 1922, is a fitting end to my two-wheeled journey. I paused for a few minutes in the middle of it and thought about how this bridge exemplifies Detroit’s ingenuity and strength during its industrial heyday. It’s a brawny, yet understated, well-built structure that incorporates two operator’s towers built from stone located kitty-corner from each other. An engineering marvel of the time, the steel floor opens from the center allowing freighters access to the Rouge River, a river that feeds our heavy industry. Despite a few scars, it appears strong, tough and ready for whatever comes its way. Much like Detroit. A couple of days ago I was riding my bike down a somewhat desolate section of Kercheval Street on my way to Belle Isle and came to the intersection of Parker Street, which runs south from where I was, to East Jefferson. Knowing that Parker cuts through the West Village Historic District and since I haven’t been through there in a while, I decided to check out the neighborhood. What struck me right away upon entering the tight-knit community, as it has on past visits, was the strong, urban feeling I experienced. Like many NYC neighborhoods I’ve visited, West Village was designed and built on the human scale that promotes walking and interaction with others. The density of the structures are uniform in their setbacks, built close to the narrow streets that seem to encourage cars to slow down, allowing us bicyclists and walkers the freedom to safely explore and experience Parker and other interesting streets found in the community. As I continued pedaling down Parker, I came to St. Paul Street. 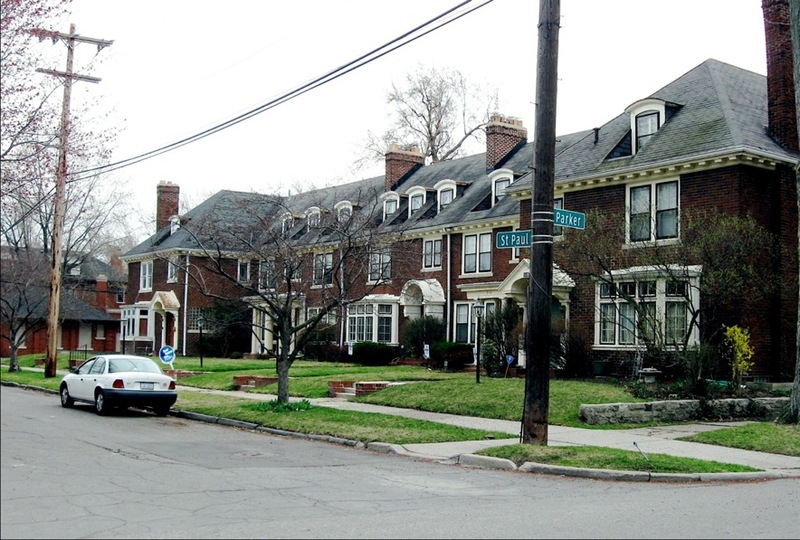 Built on each corner of that intersection are some of the most beautiful multi-unit row houses and single-family buildings found on the eastside. While sitting on my bike at that intersection and looking at the buildings on each of the corners, I was amazed at the variety of architectural styles and the extraordinary craftsmanship of these homes. The beauty of the West Village neighborhood was represented right in front of me. I was looking at a microcosm of well preserved, early 20th century architectural styles of the buildings found throughout this National Historic District. 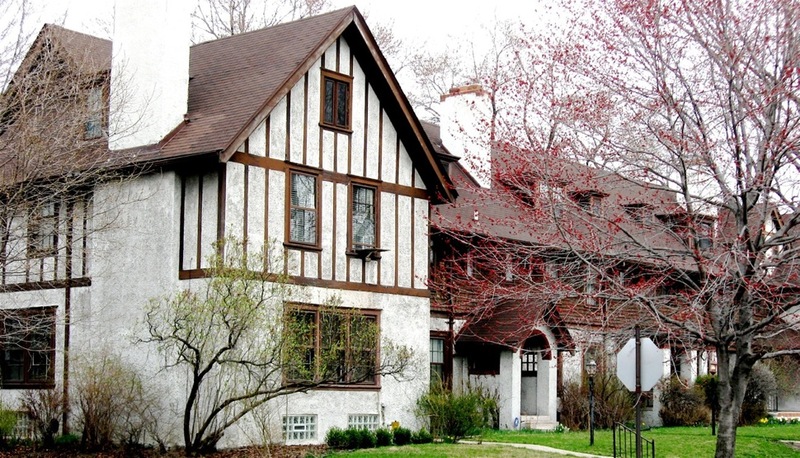 The neighborhood is full of Tudors, Arts & Crafts and many other residential architectural styles of that era. If you haven’t heard of the band St. Vincent, led by singer-songwriter, guitar, bass and keyboard player Annie Clark, I encourage you to check them out. The complex, lyrical compositions of the band can’t be categorized as pop, rock, or indie, but a blend of those genres with a little Jazz, country and a bluegrass mixed in. Clark has a sweet, haunting voice with range that is perfect for her quirky lyrics. The band was named after the NYC Hospital where Dylan Thomas, Annie Clark’s favorite poet died. Take a listen to Roslyn, a collaborative effort with Bon Iver who wrote this song for the “Twilight – New Moon” movie. If you like this tune, check out St. Vincent’s recent Austin City Limits concert where they shared the bill with Andrew Bird.